It’s holiday season and once again you may find yourself getting together with friends to go out to eat. My advice will come as no surprise to you. Do a bike ride first! Living in Southern California means that this will be possible most days, even if you have to, shudder, don a windbreaker to fend off the winter chill, like when the temperature dips below 70F. That was the case on this clear beautiful Palm Springs day when the mercury barely hit 65F. 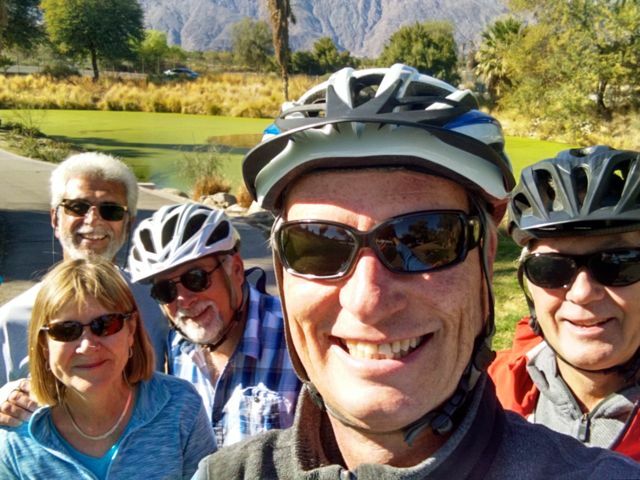 Bryan, Karin, Victor, Steve and I pedaled the 8-mile Tahquitz Creek Loop in Palm Springs, a route that consists mostly of bike trails that are so rare in these parts, albeit mostly on sidewalks next to roadways eastbound and next to golf courses (and the hazard of being whomped on the head) westbound. Group pauses on the westbound trail. Mt. San Jacinto in the background. 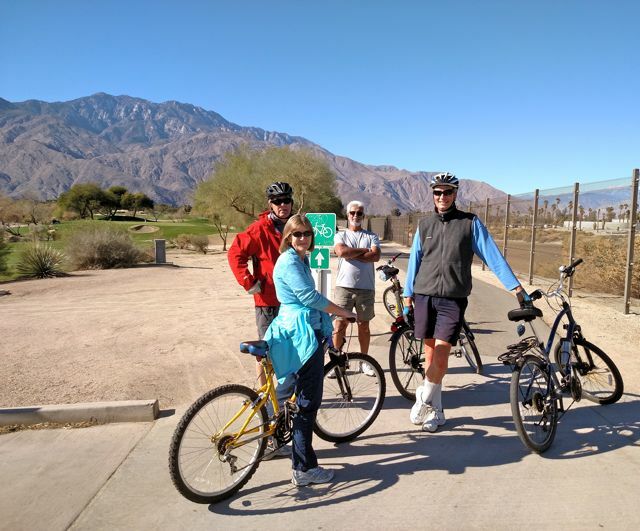 This ride (enCYCLEpedia’s PS3) is best done in the counter-clockwise direction to take advantage of the stunning mountain views as you pedal west adjacent to the golf courses. Classic Palm Springs Scenery as trail passes Mesquite Country Club. Stunning Palm Springs view near the end of the trail. Of course being Palm Springs there are plenty of after-ride eateries to choose from. On this route the Manhattan in the Desert patio is one of our favorites on warmer days. 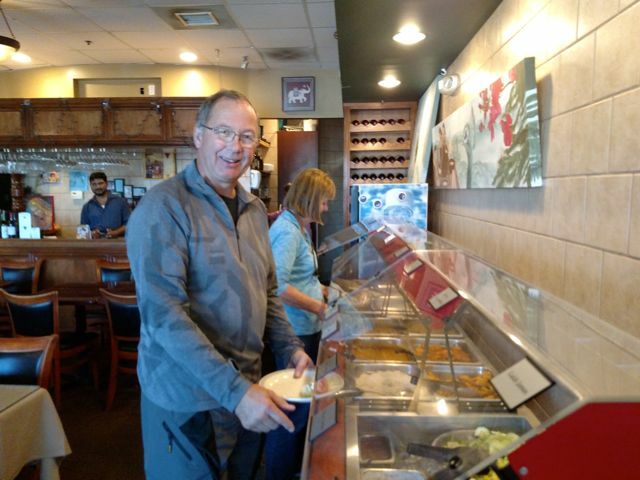 Today we chose to reward ourselves at the Monsoon Indian Cuisine (Sunrise south of Ramon), with it’s delicious lunch buffet ($11). All left very satisfied. Victor and Karin at our just reward, delicious Monsoon Indian lunch buffet.